WASHINGTON D.C., Sep. 29 /CSRwire/ - Sustainability is more than a buzzword at DC Water. Ingrained throughout the agency, sustainability is in high gear at DC Water’s fleet division where biodiesel fuel powers all 230-diesel vehicles, and emissions are closely monitored. 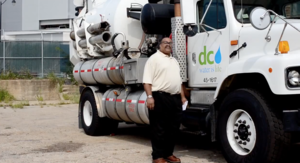 “Biodiesel just makes sense,” said Timothy Fitzgerald, Director Fleet Management for DC Water. “We switched to biodiesel in 2007 and have never looked back. It can be used in existing diesel engines, reduces emissions, and our drivers notice a big difference in fumes. More than 672,000 residents, 17.8 million annual visitors, and 700,000 people who are employed in the District of Columbia count on DC Water. The agency maintains infrastructure above and below ground. DC Water’s important work requires a large diesel fleet, including sewer trucks, utility and dump trucks, crane trucks, crew cabs and many other vehicles and equipment. Government Fleet named DC Water one of the 100 Best Fleets for 2013 and many other DC area fleets follow DC Water’s lead. Because of his leadership, the NBB has tapped Fitzgerald to be a Biodiesel Ambassador, a program also supported by the United Soybean Board. In addition to using biodiesel, Fitzgerald has incorporated the use of fleet management software that helps monitor everything from emissions to driver safety. He also works with original equipment manufacturers to ensure that all vehicles are designed to meet clean-idling specifications. The fleet division also shrank the environmental impact of its maintenance operations through the use of soy-biobased products, such as adhesive remover, hydraulic fluid, hand cleaner, grease and engine oil. “We look for opportunities to do right by the environment and our employees in every aspect of our operation – from the vehicles, to shop supplies, to building operation and maintenance,” Fitzgerald added.